I have written about my Mamaw before on the blog. The last update I gave was when she was put on hospice back in October. I am sad to say that she has passed away but happy to think of where she is and how there is now no more pain for her. She went "home" last month. She had been talking about wanting to go "home" for some time now. It still feels weird that she isn't here anymore. Telling Ella that Mamaw had passed was hard. I found out when it was just Ella and I one day. I was going to wait till Bob got home so we could tell her together but then I realized I was going to be getting many phone calls that day where I would be talking about it. I decided to just tell her myself. She had known that Mamaw was sick but we had been saying that for so long now. I just said Ella, Mamaw went to heaven today. Her response was a little shocked and just said, "Really?!" She seemed to take it pretty good. Then the following two nights during her prayer she would pray that Mamaw wouldn't die. I realized that she hadn't actually grasp the concept. After her prayer I told Ella that she didn't have to pray for Mamaw to not die because she already has. I told Ella she could instead pray for Mamaw to have a good nights sleep in Heaven. Thats when it hit her. She looked up at me with teary eyes and said, "You mean we aren't going to see her again?" It was heartbreaking. Bob told her how we will see her in Heaven one day and that made her smile. Ella asked if she could sleep with mom and dad in Heaven. Of course sweet Ella. Of course. She then pointed to the wall next to her bed and told me she wanted to hang a puzzle that Mamaw made there. It was a very sweet thing to see how a child's head makes things so simple. I began telling Ella about what a funeral was. At first she said she didn't want to go but when she found out lots of people would be there she did want to go. Mamaw had already had everything planned for her funeral. Including who she wanted to do it. Bob. She wanted Bob to speak at the funeral. I loved that. 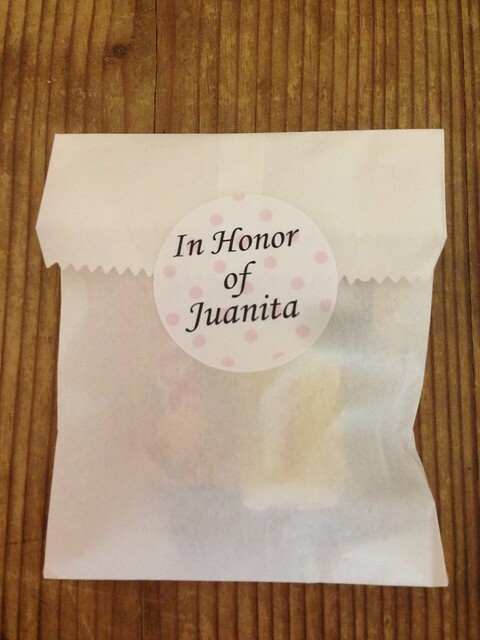 So as Bob prepared his speech, I started making funeral favors. I know. It sounds kind of out of place but I promise Mamaw would have be tickled over it. My love for candy and throwing a party all comes from my Mamaw and I know she would have wanted every single one of her friends to walk out with something sweet to remember her by. I bought the bags at Micheals craft store in the baking section. I then made the labels on Avery sticker paper. I filled 120 of them with candy and everyone seemed to enjoy them and thought it fit Mamaw perfectly. hugs & prayers!! and ella is such a sweetheart!